How the hell does anyone know what they want? Why? How? Who? So we've passed a few more arbitrary demarcations of the passage of time. I may be getting older, but my mind is becoming more agile. It better. My body certainly isn't. 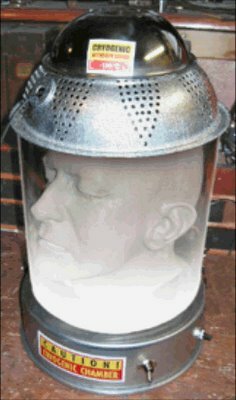 The above picture was taken from www.drfrankensteinlabs.com, where you can purchase such oddities. "Notes Toward a Supreme Fiction"
I know what you mean. I have made a lot of progress toward personal happiness and serenity by trying to live in the present moment. This morning I was looking at some trees, and they had a calming effect. Immediately, I thought to myself, I need to go out and buy pictures of trees and decorate the house with those pictures. My tendency was not simply to enjoy the moment, but to try to latch onto what I was feeling as a goal toward complete happiness in the future. Reconizing these tendencies and letting them go has been helpful to me.